By the end of the year, residents in Singapore will be able to hop into a futuristic-looking driverless pod that’ll whisk them away to work, school or other destinations thanks to a joint venture between Singaporean transportation operator SMRT Services and Dutch pod maker 2getthere. The third-generation Group Rapid Transit (GRT) vehicles run on electricity and operate autonomously – even in inclement weather – using artificial landmarks for navigation. In a joint press release, the companies said the pods are able to carry up to 24 passengers at any given time at a top speed of around 25 mph. Collectively, the pods can operate as a low-cost automated transit system that can ferry up to 8,000 passengers per hour in a single direction. SMRT Services managing director Colin Lim told Channel NewsAsia that they envision pod systems being applied in closed environments like campuses, hospitals and business parks where they could provide high quality first- and last-mile connectivity. The autonomous nature of the pods is certainly impressive but for Singapore, they could be a real game-changer. That’s because it’s ridiculously expensive to own and operate a vehicle in the island nation. The Singapore government has put in place a cornucopia of very expensive legal hoops to jump through in hopes of discouraging locals from buying a vehicle – all in the name of managing traffic congestion. 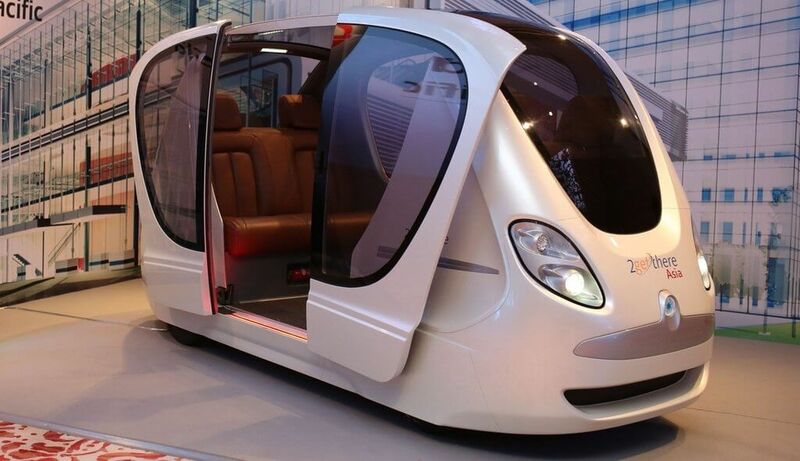 2getthere has already implemented similar pod-based transit systems in other regions including Masdar City, a carbon-neutral, car-free city in Abu Dhabi that’s powered entirely by alternative energy methods.